Off-licence chain Threshers has bought 200 sites from its collapsed rival Unwins, it has been confirmed. Administrators at Unwins said the deal was concluded overnight, and that it was Threshers' intention to reopen the stores as soon as possible. Joint administrator Myles Halley from KPMG said Threshers hoped to make approximately 1,200 jobs available. Unwins went into administration on 19 December, with 381 shops closing and 1,800 staff losing their jobs. 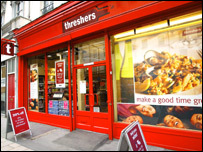 Threshers will eventually convert the 200 Unwins stores to the Threshers brand, said administrator Myles Halley from KPMG. "This is a good outcome for all concerned," said Mr Halley. "We appreciate it has been a very difficult and uncertain time for staff, particularly in the run-up to Christmas." Wine experts said Kent-based Unwins failed because its wine ranges failed to keep up with changing trends. In turn, it has inevitably been affected by the vast growth in people buying their wines from supermarkets. With its outlets centred around London and the South East, it was also hit by the growth in "booze cruises" - people going across to France and Belgium to buy their alcohol. It was a family-owned firm until March of this year, when it was sold for £32m to private equity firm DM. The chain suffered problems in recent weeks after suppliers refused to deliver stock unless they were paid upfront. With no stock left to trade with the firm began making excessive losses. Retail union Usdaw, which represents a number of Unwins staff, welcomed the announcement of the Threshers' deal. "This is great news for our members who were facing a very bleak Christmas and will give many of them new hope they will have a job in 2006," says Usdaw national officer Joanne McGuinness. The Thresher group has around 2,000 shops in the UK including the Wine Rack, Victoria Wine and Bottoms Up chains.